Heavyweight Boxer. Born: December 29, 1881, Pottawatomie County, Kansas. Died: December 15, 1968. On April 5, 1915, in Havana, Cuba, a Kansas farmer named Jess Willard became heavyweight champion of the world by defeating Jack Johnson. Willard, born in Pottawatomie County, began his professional career in 1911 at Sapulpa, Oklahoma, where he lost on a foul. Six weeks later he won over the same fighter at Oklahoma City. He followed with five knockouts and two 10-round decisions. Willard, then the largest man ever to enter the ring-six feet, six inches, and 235 pounds-had five knockouts in 1912 and lost only once, in a fight that went 20 rounds. In 1913 and 1914 the "Kansas Giant" won in New York, Buffalo, and Atlanta. As 1915 began interest started to build for the April match in Havana. By March, with both fighters training in Cuba, excitement was at fevered pitch and big bettors started to take an interest. Both training camps were jammed with spectators and a huge crowd was expected for the fight itself. All observers agreed that Johnson was quicker than Willard but all thought the Kansan could stand more punishment. An estimated 25,000 people saw the fight, which went 26 rounds. Johnson's boxing skills were superior but Willard wore him down. Both fighters bore the marks of battle but it was not a bloody fight and Johnson was able to leave the ring under his own power. 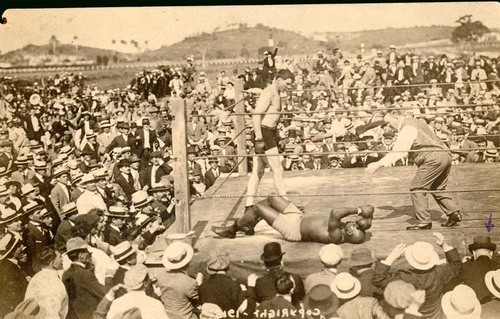 The Topeka Daily Capital said: "Jack Johnson, exiled from his own country, today lost his claim to fistic fame as the heavyweight champion of the world, the title being wrested from him by Jess Willard, the Kansas cowboy." There were those who thought Willard invincible, but that notion died in Toledo on July 4, 1919, when he was beaten soundly by Jack Dempsey. Pottawatomie County's favorite son never again seriously pursued his boxing career and the rest of his life was spent peacefully away from the ring.